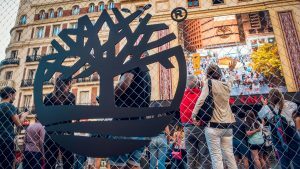 Timberland launches a spectacular new augmented reality activation to promote its new ‘CityRoam’ collection. Created by experiential innovation agency, Wildbytes, the activation invites urban explorers to discover their city from a fresh perspective. The innovative concept was developed in line with Timberland’s communication strategy, which echoes the brand’s exciting evolution from its rich outdoor legacy to its more casual lifestyle offering. 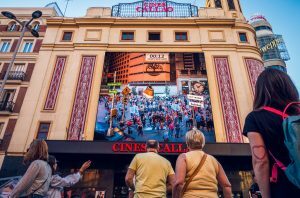 Taking place in Madrid’s central Callao Square, the incredible activation transformed the space into a breath-taking urban jungle. 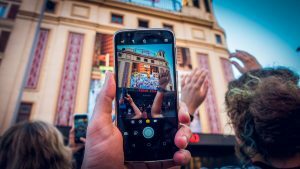 Using the enormous 101-metres-squared LED screen as an interactive AR mirror, the unsuspecting public was treated to an unforgettable experience that empowered them to be the star of their own urban adventure. After building anticipation with a countdown, the beginning of the large-scale interactive game was announced with a dramatic reveal on the LED screen, showing a giant version of Timberland’s ‘Alpine Chukka’ boot falling from the sky onto the square. The audience was encouraged to participate by jumping and gesturing to throw the AR boot back up into the air – making it react in real-time to their movements. The activation closes with the footwear’s tagline – ‘Be Light, Be Fast, Be Free’ – and a polaroid showing secret locations in Madrid, encouraging participants to view their city from a new perspective. Wildbytes was tasked with communicating the spirit of Timberland’s new collection. As specialists at creating never-before-seen experiences through cutting-edge technology, Wildbytes harnessed its own custom-built augmented reality platform for this project.